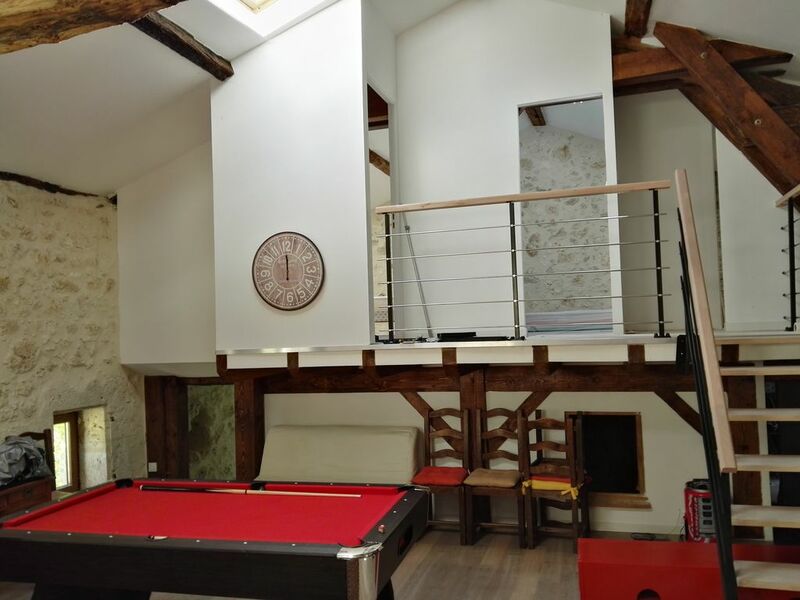 In the heart of the South-West, between Bordeaux and Toulouse, and at the gates of Périgord and Quercy, old renovated farmhouse, ideal for large families or couples in search of volume and space. Located 4km from Pujols and 7 km from Villeneuve sur Lot (all shops and services), the hamlet of Colombier, on his pech, dominates the hillside SUd of the Lot valley. Away from the residence of the owners, the cottage will seduce you with its modernity and respect for old materials. Its different levels give it a great originality: on the same level, very large living room with kitchen, living room and dining area. On a lower half-level, two bedrooms (1x140 and 2x80 or 1x160), bathroom with wc. On the floor, two rooms (1x140 and 2x90 or 1x180) and room of water with toilet. Terrace with garden furniture. Private parking. 300m² at the back of the house. Sheets and towels rental on request. Heating included in winter. Bastides to visit: Pujols, Villeneuve sur Lot, Penne d'Agenais, Monflanquin or Villeréal (country label of art and history). To taste the famous prune of Agen. super séjour de 4 jours. Le propriétaire est très accueillant. Pièce de vie magnifique, location bien équipée.